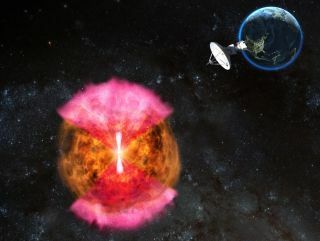 A hidden jet, shown in white, blasting a radio-wave-emitting cocoon of material, in pink, best explains the radio waves, gamma- rays and X-rays observed coming from the first-ever neutron star merger observations. For the first time, astronomers have detected evidence of a cocoon of material blasting out from a pair of merging neutron stars. Such mergers may be the source of many of the universe's heaviest elements. In August, astronomers witnessed the never-before-seen phenomenon of two neutron stars merging. Neutron stars are corpses of large stars that perished in catastrophic explosions known as supernovas. Although neutron stars are usually small, with diameters of about 12 miles (19 kilometers) or so, they are extremely dense. A neutron star's mass may be about the same as that of the sun; a teaspoon of neutron-star material has a mass of about a billion tons, making neutron stars the universe's densest objects besides black holes. The wavelengths of light released by the material ejected from GW170817 revealed that this matter was loaded with newly synthesized elements. These findings confirmed 70 years of research suggesting that neutron-star mergers are powerful enough to synthesize heavy elements such as gold, platinum and lead. Scientists had already known where lighter elements were synthesized; most hydrogen and helium came from the Big Bang, and elements up to iron on the periodic table are mostly forged in the cores of stars. GW170817 provided the first concrete evidence that neutron-star mergers are the birthplaces of half of the universe's elements that are heavier than iron. The emissions of near-infrared, visible and ultraviolet light that the researchers saw can be explained by the radioactive decay of heavy elements such as uranium and gold that were spewed out during GW170817. However, the emissions of radio waves, X-rays and gamma-rays that the scientists detected posed a mystery, researchers on the new study said in a statement. According to one model of neutron-star collisions, these puzzling emissions were the result of powerful, narrow jets of radiation given off during GW170817 and directed "off axis," or away from the line of sight of Earth. This model also suggests that neutron-star mergers are the primary sources of short gamma-ray bursts, which are among the most powerful explosions in the universe. However, researchers monitoring the merger with radio telescopes found that radio emissions from GW170817 steadily gained strength over time. This is not consistent with the off-axis jet model, which suggests the radio emissions would slowly weaken over time. Instead, the researchers now suggest that the merging neutron stars gave birth to a cocoon of material. "This is the first time a structure like this has been seen," study lead author Kunal Mooley, an astrophysicist at the California Institute of Technology in Pasadena, told Space.com. The researchers suspect that a large fraction of neutron-star mergers may generate such cocoons, which implies "there is a whole new population of as-yet-unidentified transient astrophysical events that we need to now start searching for," Mooley said. Both models suggest that when neutron stars merge, it results in an explosion called a kilonova that gives off a spherical expanding shell of debris. However, whereas one model suggests that the merger also emits a pair of tight jets of radiation that punch through this shell, the cocoon model suggests that a merger can emit a pair of much broader cones of radiation that essentially blasts a wide cocoon of matter outward "at 90 percent of the speed of light in the case of GW170817," Mooley said. Analyzing the cocoons from neutron-star mergers may shed light on the origin of many of universe's heaviest elements. "We want to find out what the frequency of such cocoon events is and the dynamics of the chemically enriched material that neutron star mergers have produced over the universe's history," Mooley said. He added that such mergers could also be the origin of cosmic rays, which are made of atomic nuclei that zip through outer space with extraordinarily high amounts of energy. The scientists detailed their findings online Dec. 20 in the journal Nature.